Our team of experienced instructors are focused on creating a safe and welcoming environment. Through skilled instruction, they provide opportunities for rest, relaxation, and rejuvenation. Laura began practicing yoga in 2002 after an injury left her unable to continue her previous physical regimen. Laura believes that yoga is a practice for everyone and enjoys helping students meet their goals, both mentally and physically. As an individual who has sustained multiple spinal injuries, Laura practices and teaches all of her classes with a special regard for spinal wellness. She has received extensive training in anatomy and continues these studies regularly with top experts in the field, including Judith Hanson Lasater. 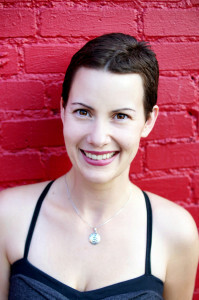 Laura enjoys teaching several styles, including hatha, vinyasa flow, yoga for children, yin, prenatal, and restorative. Since 2010, Laura has trained yoga teachers in Texas and Mexico and continues to share her passion for teaching with future teachers today. When she’s not teaching, Laura enjoys spending time with her daughter, Eleanor, and exploring the world of film photography with her husband, Mark. Bree was first introduced to the practice of yoga at the age of 16 as the perfect addition to increase her flexibility within her very physically active lifestyle. At the time she did not realize the importance the practice would have in her life. At the age of 19, a serious back injury would lead to months of slow rehabilitation, taking Bree away from the overly active life she had known. After months of slowly gaining back strength, she would step back on her yoga mat with new eyes and intention. Bree learned the value of creating ease in the mind and body and the importance of taking time to honor her body as it healed. Yoga allowed Bree to build herself back up, both physically and mentally. By 2014, Bree had become a dedicated yoga practitioner, which led her to crave more knowledge of this wonderful tradition. In 2015, she began her journey to educate herself by deepening her knowledge and after completing her 200 hour teacher training course with North Texas Yoga in 2016, Bree immediately began sharing the practice within her community. She has continued to pursue her desire for deepening the practice of yoga for herself and others by working toward the completion of her 500 hour teacher training. Bree's focus in her teaching is to help her students take a step back from their hectic lives, assist them in slowing down, and give each person that well-deserved time for peace. While Bree teaches many styles of yoga, she has a deep passion for balance and slowing things down with practices such as restorative, yin, gentle, and hatha yoga. Off the yoga mat, Bree is a professional photographer, travel junkie, and full-time dog mom. Paige started practicing yoga in her twenties as a good way to exercise and increase flexibility. Over the years, she started practicing less as life got hectic, and she sustained different injuries from a variety of physical activities. She found herself overworked, stressed out, and exercising with no real benefit. After the birth of her 3rd child, Paige was seeking a more balanced lifestyle, so she committed herself to learning more about yoga and the mental benefits it could bring to her life. Paige learned to be present, mindful, and to connect with her breath. She also found herself getting stronger, becoming flexible, and doing things she never thought she could do. She fell in love with the practice and couldn't wait to learn how to share her love of yoga with others. Paige made the commitment to teacher training and completed her 200 hour yoga teacher training in 2017 with North Texas Yoga. She enjoys sharing the practice of yoga and the growth she sees in her fellow practitioners. Having injuries herself, she aims to help her students practice safely, yet have fun. Always a student first and eager to learn more, she practices as often as she can. Off the mat, she has a full-time career in medical sales and enjoys an active life with her husband, 3 children, and 2 dogs. Cheryl has been dancing for 30 years and holds a BFA and MFA in dance from Sam Houston State University. Although she was trained in classical ballet and modern, her college education instilled an appreciation of the mechanics of the human body and how to work within its given structure. Since 2008, she has been teaching for Collin College and was formerly with Eastfield College and Richland College. She enjoys the challenge of teaching multiple genres, including ballet, modern, tap, jazz, and hip hop. Branching out into other bodywork and fitness styles has allowed Cheryl to discover how all forms of movement can benefit each other in the care and maintenance of the body. By teaching barre classes, she is able to share the joy and challenge of ballet movements to a wider range of people. In 2011, Cheryl discovered how beneficial yoga can be to dancers and athletes. She fell in love with this ancient mind-body practice and its therapeutic abilities for people of all walks of life. Cheryl received her 200-hour yoga certification through North Texas Yoga in 2015 and is completing the final components of her 500 hour training with North Texas Yoga this year. Michelle began her yoga practice in 2005 as part of a fitness routine and practiced off and on for several years. In 2013, at the urging of her sister, a yoga instructor, she began to learn more and expand her practice. Through her studies, Michelle found something that she didn’t even realize she had been searching for: a path to physical, mental and spiritual health that she now has the passion to share with others. She completed her 200-hour teaching certification in 2014 and enjoys teaching students of all walks of life in gentle and slow flow.